All Smiles for Award-Winning Dental Hygiene Prof.
PARAMUS, N.J. – Bergen Community College dental hygiene professor Joanna Campbell, RDH, FAADH, has earned the institution’s 2018-19 National Institute for Staff and Organizational Development (NISOD) Excellence Award. “Professor Campbell is an excellent instructor in the dental hygiene program who has distinguished herself at the College through her leadership in assessment and dedication to advising,” Bergen Vice President of Academic Affairs William Mullaney, Ph.D., said. 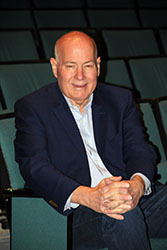 Campbell, of Bronxville, New York, began teaching at Bergen in 1977 as an adjunct faculty member. Since then, she has served as a professor in the dental hygiene department and later as chair of the program from 2008 to 2012. Campbell has taught clinical dental hygiene, dental anatomy and radiology courses. Nominated by fellow faculty member Gail Fernandez, Campbell has also served as an assessment fellow and general education liaison to standardize critical thinking in courses at the College. The NISOD honoree earned an A.S. in applied science and a B.A. in dental hygiene from the University of Bridgeport, an M.A. in health education from New York University, and an M.A. in computing in education from Teachers College, Columbia University. Campbell is a fellow in the American Academy of Dental Hygiene and was appointed by the American Dental Association’s Joint Commission on National Dental Examinations to serve on the National Board Dental Hygiene Test Construction Committee components II and III where she is responsible for recommending and implementing test specification changes in examinations in the field of dentistry. She is also a consultant member of the Commission on Dental Competency Assessments and a site visitor for the Commission on Dental Accreditation. Campbell will accept her award in Austin, Texas this May during NISOD’s annual international conference. NISOD is a consortium of community and technical colleges committed to promoting and celebrating excellence in teaching, learning, and leadership. The NISOD Excellence Awards were established in 1991 to provide NISOD-member colleges with an opportunity to recognize individuals doing extraordinary work on their campuses. Since then, more than 25,000 recipients have been honored with the Award by their colleges. Each spring NISOD hosts an annual International Conference on Teaching and Leadership Excellence where Excellence Awards recipients celebrate their achievements and accomplishments at an awards dinner and celebration. To learn more about NISOD, visit www.nisod.org. PARAMUS, N.J. – The National Endowment for the Humanities (NEH) has awarded a $35,000 Humanities Connections Grant to Bergen Community College to expand the role of the humanities in the College’s criminal justice courses. Selected from 139 proposals, Bergen was the only community college in New Jersey to be awarded NEH’s Humanities Connections grant this cycle. The grant aims to educate communities about law enforcement and empower future law enforcement officers to work with diverse communities through humanities, literature, and art. “We are confident that this combination of integrated academic experiences and practical hands-on application will benefit our criminal justice students, and by extension, our criminal justice system and our society as a whole,” project co-director Eileen Fitzgerald, assistant professor of English, said. According to the pair, a series of classes will be tailored for criminal justice students in a three-pronged approach of interdisciplinary courses, a capstone project, and community interaction. The cohort of students will experience an integrated learning environment where they will be exposed to a greater variety of narratives in text, film, art and music to enrich their critical thinking and communication skills to prepare them for the workforce. The project embraces the College’s larger vision for an interdisciplinary approach between skills-based training and the humanities. For example, to create a field-based experience, the program will collaborate with the New Jersey Police Chiefs’ Association as well as other local professional organizations and potential employers. The program will be articulated with a comparable baccalaureate degree program at the John Jay College of Criminal Justice. Students will also have the opportunity to apply their classroom studies to service learning projects. Set to begin during the summer 2019 term, instructors from art, history, literature, philosophy and religion will collaborate with instructors from criminal justice and legal studies to design learning communities and contextualized courses that integrate concepts, readings, assignments, and competencies with a criminal justice theme. “The planning committee is very excited about receiving this grant because the generosity of the National Endowment for the Humanities will enrich the pre-professional experiences of our criminal justice students,” Fitzgerald said. Bergen’s popular criminal justice program includes approximately 850 students who seek to enter positions in law enforcement, homeland security, corrections, forensic science, private security and legal services. Created in 1965 as an independent federal agency, the NEH supports research and learning in history, literature, philosophy, and other areas of the humanities by funding selected, peer-reviewed proposals from around the nation. Additional information about the NEH and its grant programs is available at www.neh.gov. PARAMUS, N.J. – Enjoy an evening of storytelling and stand-up comedy when Bergen Community College Professor Brian Altano, of Ridgewood, and his son Dan present “Making the Sauce,” an ode to the Sunday morning Italian tradition Friday, May 3 at 7:30 p.m. in the Anna Maria Ciccone Theatre (400 Paramus Road). A professor for more than 30 years, Brian is a writer and storyteller who has appeared on radio and television shows and performed in theatres around the world. He has also written 15 books. His son, Dan, is a member of the nationally-touring stand-up group Escape from New York. He performs regularly at Comic Strip Live, Caroline’s on Broadway and the New York Comedy Club. He was recently featured in the New York Comedy Festival. Show ticket prices for the general public are $35, with discounts offered to senior citizens, Bergen faculty and students. For additional information, please call (201) 447-7428 or visit tickets.bergen.edu. PARAMUS, N.J. – Won Joon Kang, a business administration student at Bergen Community College, has been named a Fall 2018 Oberndorf Lifeline to Completion Scholar by the Phi Theta Kappa Honor Society and has received a $1,000 scholarship. Kang, of Mahwah, is the first student at Bergen to receive the Oberndorf Scholarship and one of seven students selected internationally to receive the award. “As the chapter’s co-advisor, I am extremely proud of Won Joon for his extraordinary accomplishments,” Bergen Phi Theta Kappa Administrative Adviser Angie Goldszmidt said. 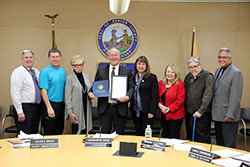 HACKENSACK, N.J. – Joining the nationwide celebration of U.S. community colleges, Bergen County Executive James J. Tedesco III and the Bergen County Board of Chosen Freeholders have each signed proclamations recognizing April as Bergen Community College Month in Bergen County. The county executive and freeholders presented the proclamations to College President Michael D. Redmond, Ph.D., and Board of Trustees Secretary Joseph Barreto at the April 3 freeholders meeting. *A series of workshops that will assist students fill out their Free Application for Federal Student Aid (FAFSA), which can help them become eligible for programs that can help pay for college – even by making it tuition-free. Visit one.bergen.edu/fafsa for more information. *An April 25 collegewide open house from 3:30 to 7 p.m. at the main campus at 400 Paramus Road in Paramus. Visit bergen.edu/openhouse for more information. *The April 30 opening of its state-of-the-art STEM Student Research Center at 11:30 a.m. and the unveiling of the $50 for 50 donor wall at 3 p.m. The College will also host government leaders for a luncheon prepared by culinary students. Students can tour Bergen Community College’s main campus in Paramus April 25. PARAMUS, N.J. – Tuition-free college and a special preview of the institution’s new STEM Student Research Center will headline Bergen Community College’s upcoming open house Thursday, April 25 from 3:30 to 7 p.m. at 400 Paramus Road in Paramus. At the event, attendees will have the opportunity to view the state-of-the-art STEM Student Research Center, which will officially open five days after the open house. The facility includes supercomputers, a standing 3-D printer and drone cage. Focus on STEM continues at Bergen as the federal government estimates U.S. employers will add nine million STEM jobs by 2022. Projects at Bergen have included converting a softball field house into a workshop, high-altitude balloon launches conducting experimental testing with two wind turbines and a solar panel system. Additionally, prospective students can receive assistance filling out their Free Application for Federal Student Aid (FAFSA) at the open house, which can help them become eligible for programs that can help pay for Bergen – even by making it tuition-free! Attendees should please bring their/parents’ 2017 tax return. The comprehensive, campus wide open house at New Jersey’s No. 1 ranked college for associate degree graduates will also feature demonstrations, workshops and tours. Families can meet with current students, faculty and staff, sample the culinary creations of hospitality students and explore the fashion design lab, broadcasting studio, horticulture greenhouse, animation lab, theatres, the Child Development Center, Veterans Center, flight simulators and more. To RSVP, visit bergen.edu/openhouse or email [email protected]. Información disponible en español. Bergen’s main campus in Paramus. Summer classes at the main campus in Paramus, Bergen Community College at the Meadowlands in Lyndhurst and online include general education requirements such as English Composition, General Biology and Statistics ideal for transfer to many four-year colleges. Students can select from four different sessions of day and evening options, while the institution’s in-county tuition rate of $146.50 per credit provides an affordable alternative to four-year schools. Registration also opens April 1 for the fall semester. Bergen offers more than 130 degree and certificate programs in areas such as aviation, criminal justice, dental hygiene, fashion design and hospitality at three locations and online. To register, visit bergen.edu or the College’s locations in Paramus (400 Paramus Road), Lyndhurst (1280 Wall Street West) and Hackensack (355 Main Street). For more information, please call (201) 447-7200. For students making their college decision, Bergen will sponsor an open house at its main campus (400 Paramus Road, Paramus) Thursday, April 25 from 3:30 to 7 p.m. The event will feature demonstrations, workshops, tours, exhibits and opportunities for potential students and their families to explore all that the College offers. To RSVP, visit bergen.edu/openhouse or email [email protected]. Información disponible en español. Bergen, New Jersey’s largest community college with approximately 14,000 students taking classes this semester, ranks No. 1 in the state for associate degree graduates. Alumni have studied at every Ivy League institution and rank 11th in the U.S. for mid-career salaries, according to Payscale. Its resources include the Cerullo Learning Assistance Center – twice recognized as the top tutoring center in the U.S. – and satellite campuses in Lyndhurst and Hackensack. PARAMUS, N.J. – New Jersey Secretary of Higher Education Zakiya Smith Ellis, Ed.D., will deliver the keynote address at Bergen Community College’s annual commencement. Smith Ellis represents the state’s top higher education official and the first to headline Bergen’s commencement since New Jersey Commission on Higher Education Executive Director James E. Sulton Jr., Ph.D., in 2000. Bergen’s graduation ceremony will take place May 23 at 10 a.m. at MetLife Stadium in East Rutherford. Prior to her appointment as Secretary of Higher Education in Feb. 2018, Smith Ellis worked in the Obama White House as a senior adviser for education and in numerous roles regarding college affordability and government relations. She also taught in the K-12 education system. In 2018, Bergen celebrated its 50th anniversary at commencement with special presentations, vignettes and remarks from Gov. Phil Murphy. John W. Davis, Ph.D., of the NAACP Legal Defense Fund, delivered the College’s first commencement keynote in 1970. PARAMUS, N.J. – Bergen Community College has received a $12,000 grant from the CVS Health Foundation and the American Cancer Society to develop campaigns targeting the elimination of smoking and tobacco use on- and off-campus. Although the College banned smoking on campus in 2007, the rise of e-cigarettes and other tobacco-delivery devices have prompted institutions to create new efforts for helping students understand the dangers of smoking, tobacco and nicotine. Under its new “Breathe Clear Campus” initiative, the College will become smoke- and tobacco-free by June 2020. Including another $3,600 grant from the New Jersey Prevention Network, the College has received $15,600 to support the program. Recent data from a public opinion poll conducted by Morning Consult for CVS Health showed 57 percent of U.S. college students say a tobacco-free campus is important to them when considering applying to or attending a college. Data from this research and other studies have prompted Bergen’s Office of Student Life & Conduct and Student Government Association to identify tobacco use as a focus area for action. The groups collaborated to apply for grants and develop a plan for what would become “Breathe Clear Campus” taskforce. Bergen’s Student Government Association chief justice and taskforce co-chair Gabriella Setti agreed. “Using this funding, we plan to review Bergen’s current policies and implement new strategies that will allow us to reach our goal,” she said. Bergen will host prevention education activities including health fairs and town hall forums to discuss the dangers of tobacco use and share prevention methods with students. A national event, “the Great American Smokeout,” which challenges smokers to quit cigarettes for 24 hours, will also take place.